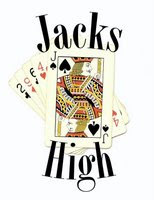 My band, Jacks High has finished recording its first song! It is a cover of "Gimme Three Steps", and it is available here as an MP3. It features Tom on lead vocals and guitar. More to follow! We are working on another two tracks, and hope to have them done shortly.